No, that’s not a Detroit tourist attraction today, nor a scene from Kathryn Bigelow’s latest movie. But once upon a time, guests attending Motown Records’ first national sales convention in August 1967 were given the opportunity to view how riots and rebellion had scarred the city one month before. What’s more, the bus belonged to a Motown musician for whom the ravaged 12th Street area was less than a mile from where he and his fellow Funk Brothers went to work, making music which crossed a racial divide. The convention was planned, before the carnage of July, for the last weekend of August. The event was the responsibility of sales supremo Barney Ales, whose bonds with a cross-country network of record distributors were vital to Motown’s success. The company shipped them the “product” – singles and albums – to sell to local retailers. It was also up to each distributor to obtain local radio airplay, under the keen-eyed direction of Ales and his promotion team. This was the other Motown machine: once the music was made, Ales toiled, like the auto factory worker he once was, to get the records played and the company paid. Motown was arguably at its creative and commercial peak in 1967, so the decision to stage a sales conference (dubbed “Showcase ’68”) in Detroit for its business partners was logical: to strengthen working relationships, to reward effort, to entertain – and to sell the hell out of a new-album release schedule. Ground zero was the Pontchartrain Hotel, a luxury, 25-storey shaft of accordion-pleated glass – downtown, far from the riots’ flashpoint – which had opened just two years earlier. It was close to the Detroit River and to Cobo Hall, where in 1963 Rev. Martin Luther King had delivered the first iteration of his “I have a dream” speech. At the “Pontch,” Motown installed nearly 200 guests from August 25-28. “We had never done anything like this before,” Barney Ales told me, “and some of the distributors’ wives were a little nervous about coming.” The husbands? Hardly. Most were pugnacious traders who had served in the U.S. armed forces during World War II, and were unlikely to be deterred by civilian arsonists. “Besides,” said Ales, “we had everything set up for them ahead of time.” This included chauffeured limousines, red-blazered hosts, hospitality suites, a themed opening dinner (“A Night in Paris”), a racetrack visit and a riverboat cruise. Helping out-of-towners to see a fire-extinguished ghetto is not how Brokensha is usually remembered. The late Australian musician was one of Motown’s valued session men – who played, for example, vibes and percussion on What’s Going On – and a highly-regarded jazzman operating his own Detroit nightclub during the 1960s. Before that, he was a member of the Australian Jazz Quintet, which toured the U.S.
After the quintet dissolved Down Under, Brokensha settled in the Motor City. “People say to me, ‘Why did you come to Detroit? There’s nothing doing here.’ These people must be walking around with blinders on,” he told the Detroit Free Press soon after opening his club, Brokensha’s, near the Fisher Theatre in 1966. At Hitsville, he was known as “White Jack,” to distinguish him from fellow percussionist “Black Jack” Ashford. Owned and operated by Ernie and brother George, United handled the Tamla label in the Windy City (another distributor had Motown and Gordy). George preferred the creative side of the business, even selling one of his productions to Motown in 1962, shortly before setting up his own One-derful label. Ernie then took sole command of United, which – in addition to Tamla – distributed the likes of Duke, Excello, Savoy and Scepter during the ’60s. He was outgoing, gregarious, highly visible in the industry – and a serious photographer. Ernie and his camera were much in evidence through the Motown convention. It seems unlikely that he would have wanted to tour the troubled, rubbled blocks of Detroit, but if he did, he would have taken some remarkable pictures. After the weekend’s socialising, the reckoning. On Monday, August 28, Barney Ales and his crew introduced the company’s latest music to the distributors, with order pads at the ready. This was Motown’s largest-ever release schedule, featuring albums by Stevie Wonder, the Temptations, the Four Tops, Marvin Gaye (solo and with Tammi Terrell), Jr. Walker & the All Stars, the Isley Brothers, Martha & the Vandellas, and many more. 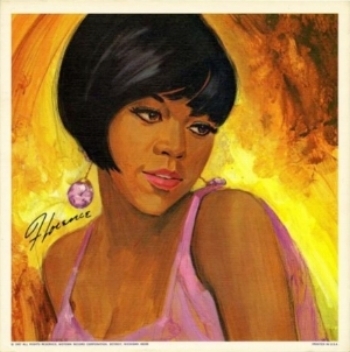 The single biggest seller was, unsurprisingly, Diana Ross & the Supremes’ Greatest Hits, a 20-track, 2LP set which also included reproduction oil-painting posters of Diana, Mary and Florence inside the “deluxe package.” The group performed at the “Showcase ’68” finale, sensationally closing a two-hour show which also featured Wonder, the Spinners, Gladys Knight & the Pips, Chris Clark and ventriloquist act Willie Tyler & Lester. The Motown founder’s prescription for the future was improved education, within and between the races – although at that particular moment, the songwriters of “Reflections” might have more accurately captured the mood seven miles away, at 12th Street: “In you I put/All my faith and trust/Right before my eyes/My world has turned to dust.” And the passengers on Jack Brokensha’s bus would have seen that dust, too, right before their eyes.